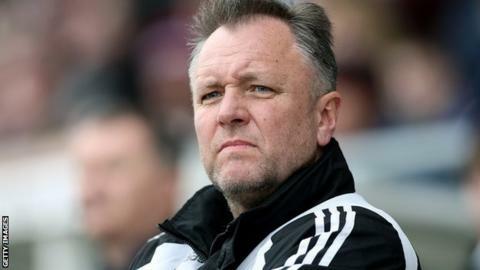 Lincoln City have named their former assistant manager Gary Simpson as their new boss until the end of the season. Simpson worked as Keith Alexander's number two from 2002 to 2006 and was more recently Macclesfield Town boss. Grant Brown, who had been in caretaker charge of the Blue Square Bet Premier side for the last two games, will stay on as Simpson's assistant. Simpson, 51, takes over with the Imps two places and two points above the relegation zone. David Holdsworth left by mutual consent last week, and although Lincoln impressed in Tuesday night's match against East Midlands rivals Mansfield Town, they lost 1-0 and only drew the other game under Brown and so remain perilously close to the foot of the table. Sheffield-born Simpson has a strong link to Lincolnshire. He played almost 200 games for Boston during two spells with the club and was also player manager with Gainsborough Trinity for two seasons.